Since freezing my bum off yesterday had so sharply underlined for me the hazards of sitting motionless for hours in the midwinter snow I made an effort, today, to get to my favourite spot within a half hour of when I figured that dusk would start to fall. There's very little point showing up much before this in Winter I gather; if it's nearly too dark to see anything at all then it's just about the time that rabbits will venture outside. Happily, the brief interval between 'I can clearly see that there are no rabbits' and 'I can't see a damn thing' yielded me the first bag of 2010. Joy! I was - as they say - well chuffed. My thanks again to Fred for the scope he was kind enough to bung me in the mail when my foolishness trashed the Hawke. Idiosyncratic the Rhino may be, but it's hugely more effective in low-light than iron sights and my old myopic peepers! 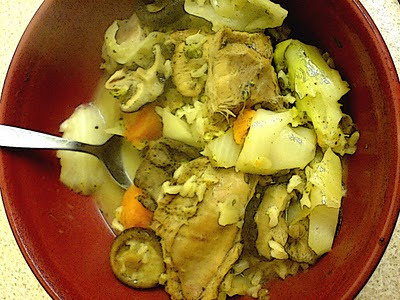 Using the only Rabbit Stew Approved Recipe ('use what's in the cupboard'), I stewed the meat in a stock made from the butchered carcass (which I later removed) added rosemary, thyme and parsley, a spot of Agave nectar that was lying around to sweeten slightly, some dried Shiitake mushrooms that Santa brought me, plus carrots, cabbage, broccoli and rice. Dusk and first light is hunting time for all preditors. But on overcast days animals will often come out to feed early. Well done with the rabbit. My wife once produced what we called "Kentucky Fried Rabbit", it was a taste sensation! But like you she had made the recipe up and not written it down and has been unable to reproduce that cullinary delight again! Over Christmas Lidl decided to do a special on nightsights; a Bresser version of a Newton Hornet digital nightscope for £99. Needless to say, I hoofed it down to the local Lidl store and bought one (they were being kept in a storeroom on account of lightfingered customers), and found that against all expectations the things do work very well. If you turn on the IR light on them, you even get pretty decent eyeshine off bunnies, so you can have a look into a field to see if there's anything there and where it is before you go in. 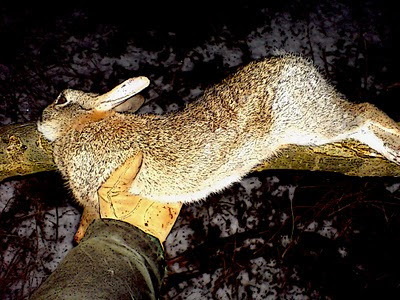 Apart from that, the other tool you need for night shooting bunnies is a red-filtered light of some sort; doesn't have to be much as long as it puts out a fairly good narrow beam. With this you can see to aim onto bunnies at night without unduly disturbing them, as long as nobody else has been out before and educated them as to the perils of lights at night.